and completely automate it with a single CLIC. 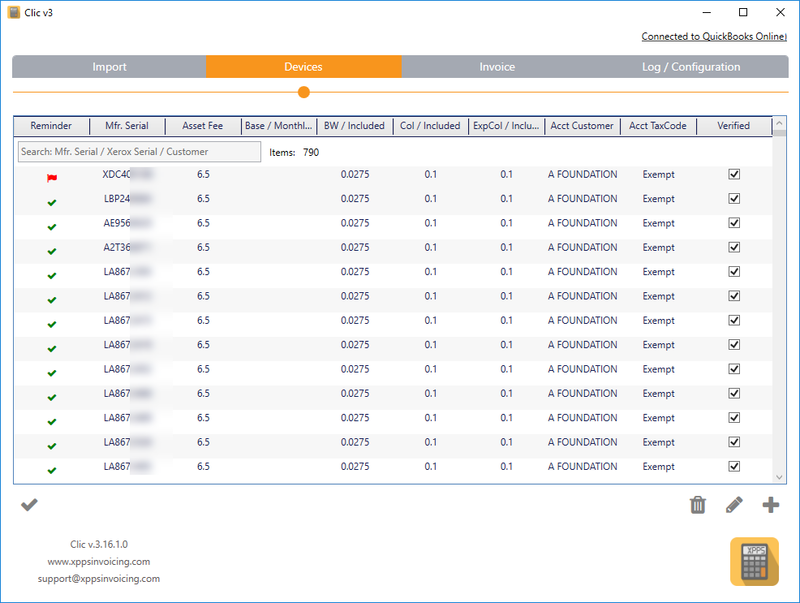 CLIC provides simplified, automated processing of your XPPS invoicing. With full support for the native XPPS file format, and popular accounting platforms, CLIC takes the hassle, time, and errors out of your monthly billing process. CLIC supports QuickBooks Desktop, QuickBooks Online, Sage 50 and coming soon, Sage One. Is CLIC a Desktop or Web app? CLIC is a desktop application and we recommend it be installed on the same PC that runs your accounting/bookkeeping application. Integration: In an effort to connect to the widest range of platforms, we need a desktop application. Connecting to web apps from a desktop application is easy, connecting from a web application to a desktop applications such as QuickBooks Desktop, is an entirely different, and difficult proposition. How much does CLIC cost? CLIC's price is based on the total numbers of XPPS devices under management. For less than 250 devices, the cost is $100 per month and is billed to a credit card. If you would like a quote, and to better understand our pricing mode, please email info@xppsinvoicing.com. Keep in mind, the profit you receive from the Asset Fee is designed to offset your internal costs to manage (aka invoice) these devices. We take a portion of that profit and automate the bulk of that process. Are software updates included in the price & how are they delivered? All version updates are included as long as you have a valid subscription. These updates are delivered automatically. Each time you start CLIC it checks to see if a new version is available and gives you the opportunity to update. All you need to do is click Yes and the updates are automatically installed. Devices where the Base Fee is greater then the Base / Asset fee you are charging your client - likely a case where the device is no longer on XDA. Devices that have moved to a different client - the Xerox Excel file shows a new client name. Devices showing Base / Asset fee credits. ...the list goes on, contact us for a full review of validation and warnings that CLIC provides. What accounting/bookkeeping products do you support? Does CLIC have custom integration with 'X' accounting/bookkeeping product? If you have an accounting product that we do not currently support, please our support team for more information - support@xppsinvoicing.com. If we don't have it, we can likely build it! Can you automate an annual increase? A question so often asked, it's under development. Expect an update soon where devices will automatically increase Asset, Base, BW, Col, Exp Col values on a specified interval. Oh, and send you client a notification on the months prior invoice! Do the client names in Excel need to match the client names in my accounting software? No, they don't need to match. 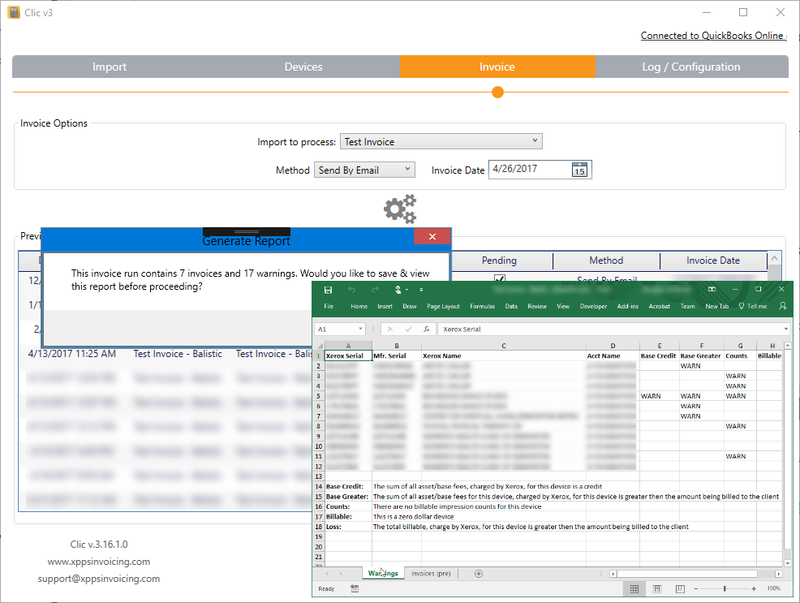 When a new device is found, you connect it to an existing customer name in your accounting software. Want to sign up, looking for a demo, need support, or any other question...drop us a line below. © 2019 Ballistic Echo Inc. All Rights Reserved.